Desevio Payne, a United States national team prospect, is settling into the new year in the Dutch Eredivisie nicely, it seems. 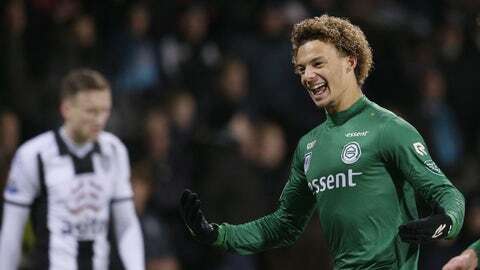 The 21-year-old made his first appearance of the season for Groningen on Saturday and scored his first professional goal, a low strike that put his side up over Heracles in the 34th minute. While the goal is a special milestone for the youngster, more important is seeing the defender get minutes and show well. Although he may still be a ways away from gaining wider recognition among USMNT fans, he has some chance to break through due to the USMNT’s lack of fullback depth. Payne is primarily a right back, but he can play on the left. Payne featured for the U.S. U-23s in the second leg their failed attempt to quality for the 2016 as well as for the U.S. in the U-20 World Cup in 2015. He also made our list of the 20 USMNT prospects aged 21 and under to watch. He is eligible to play for the U.S., Netherlands and Trinidad & Tobago, but he has no senior caps yet. While new manager Bruce Arena is clearly focused on the short-term and qualifying for the World Cup, the fullback position is the subject of some concern. A few-second glance at the fullback depth chart, particularly left back, is enough to realize the Americans have some serious vulnerability there – and although Payne is way down in the depth chart, there is far less competition there than at any other outfield position on the USMNT. Just because Payne played 90 minutes and scored a goal in the Eredivise doesn’t mean he is going to break into the USMNT anytime soon, but anything a young player can do to call positive attention to his club play is a good thing. There’s plenty of opportunity ahead for him. It’s too soon to know how much more Groningen will rely on the youngster, but he continues to be a prospect to keep an eye on and if regular playing time does come, who knows how quickly he might be with the Yanks.